The service record of Ebenezer Denyer, my second great grandfather, is described in A Brief History of John and Christian Fretz, Rev. A.J. Fretz, 1890. 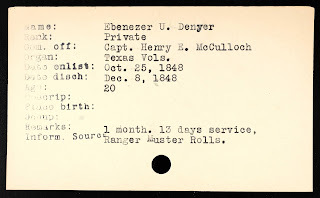 "Mr. Denyer served in the Mexican War of 1848, with Captain Henry McCohlogh, and was with the Ohio Rangers for several years. About 1858, he moved to Onion Creek, Hays County, Texas, where he remained until the breaking out of the Civil War, when, after moving his wife to her mother's home in Eastern Texas, he joined the 2nd, Texas Company Volunteers, mustered at Marcos, Hays County, in the summer of 1861, and served throughout the war in the Confederate service. He was taken prisoner at Vicksburgh, Mississippi, was exchanged, and laid in the hospital at Galveston until the close of the war." My grandmother wrote to the Department of Interior in 1933, providing what she knew from the above family history, and requesting confirmation of her grandfather's war service. She was seeking membership in the Daughters of the Confederacy, and her nephew was seeking a scholarship. 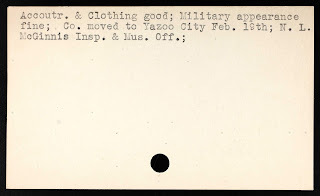 She received responses from both the Department of War and the Texas Library and Historical Commission State Library. 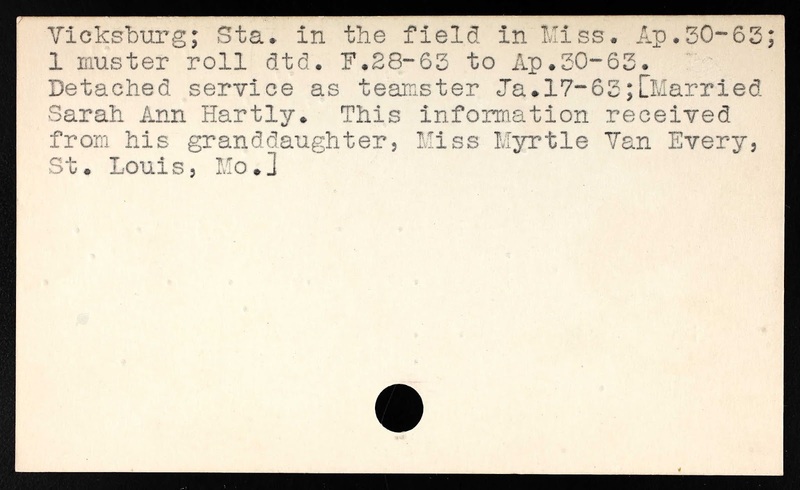 Several years ago I found his muster roll records at Fold3. 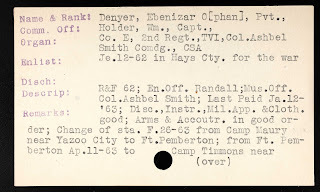 Recently I found his name in the Texas Muster Roll Index Cards database at Ancestry. There wasn't any new information, which isn't surprising. They're index cards for the muster rolls I had already found. 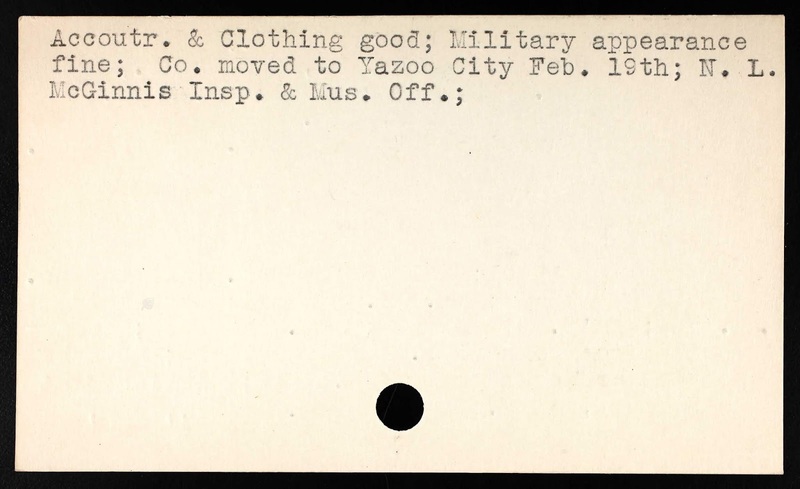 But in addition to providing a summary of his activities, there was a surprise waiting for me on the last index card below. Source information:Ancestry.com. 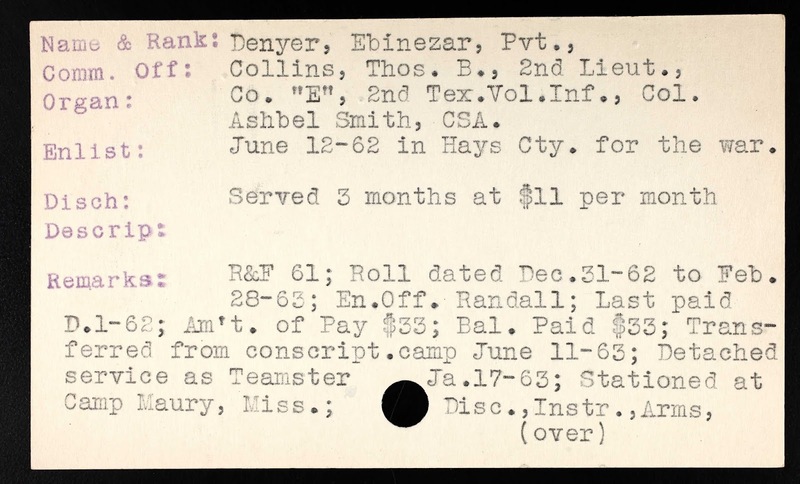 Texas, Muster Roll Index Cards, 1838-1900 [database on-line]. Provo, UT, USA: Ancestry.com Operations, Inc., 2011. 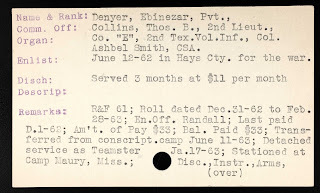 Original data: Civil War Muster Rolls index Cards (both Confederate and Union). Also Texas State Rangers. Austin, Texas: Texas State Library and Archives Commission. Remarks: 1 month. 13 days service. Ranger Muster Rolls. Organ: Co. "E", 2nd Tex. Vol. Inf., Col. Ashbel Smith, CSA. Enlist: June 12-62 in Hays Cty. for the war. 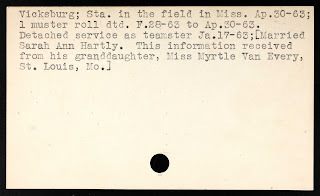 1) The information on the last index card above clearly matches the information the Texas Library and Historical Commission State Library gave my grandmother in 1933. I love that they added to their record some of the information she had given them, and cited her as the source. 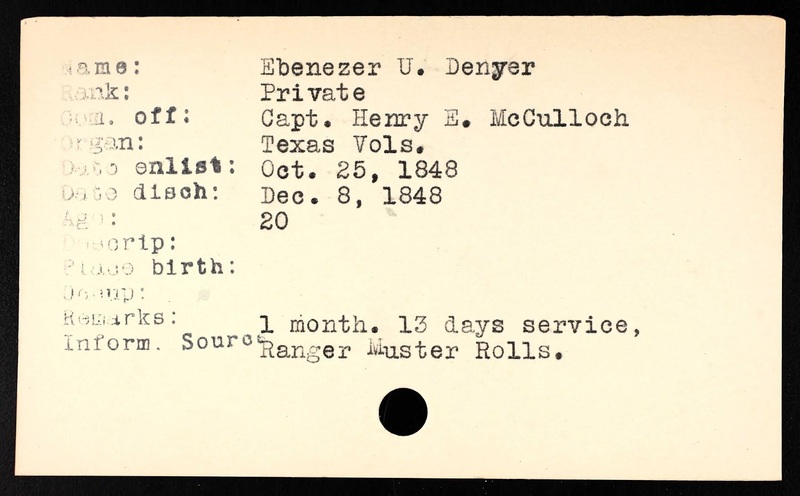 I'm certain that the bracketed part of Ebenezer Denyer's middle name also came from my grandmother.